The Phoenix Theatre opened in 1930 with the premiere of Noel Coward's Private Lives featuring Coward himself in the cast, along with Gertrude Lawrence, Adrienne Allen and a young Laurence Olivier. The current production Blood Brothers, a musical by Willy Russell which transferred from the Albery in 1991, is the longest running show ever at the Phoenix. 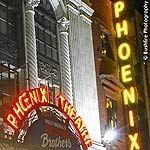 Do you work at Phoenix Theatre? What did you think of Phoenix Theatre?